Naslovna / Novosti / Invitation: Power of Microbes, Malinska, Croatia, 2010, 22-25.9.2010. Invitation: Power of Microbes, Malinska, Croatia, 2010, 22-25.9.2010. 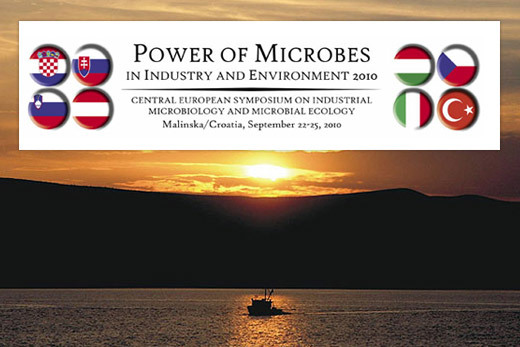 In the year 2002 Croatian, Hungarian and Slovenian microbiological societies organised a joint meeting “Power of microbes in industry and environment” in Opatija, Croatia, covering some of the most prominent topics of applied microbiology. Five years later the second meeting with a similar scope was held in Zadar, Croatia, this time with the Czechoslovak society joining the family of co-organisers. It was at that meeting when a decision was made to continue the series of symposia every three years thus it is our pleasure to invite you to “Power of microbes in industry and environment 2010“. The meeting will this time be held in a small Adriatic town of Malinska at the island Krk. North-Adriatic location and the bridge connection to mainland provide easy access to the venue and the picturesque landscape and people’s hospitality make agreeable atmosphere for exchanging ideas and promoting scientific contacts among microbiologists in Central-Europe, or broader. The organisation of the symposium will be supported by FEMS enabling grants for young scientists and invited speakers. If you would like to join us in Malinska, please register electronically and you will receive the next announcements with all the necessary details.